Baking. Something I love. Something I don’t do as often as I want. Because I am quite lazy. Also because I know I’d eat it all and that’s not what you want when you’re trying to get back in shape! Yet when I do bake, I like to take photos and share with you the results of my culinary ventures. And the recipes as well! This one makes no exception! 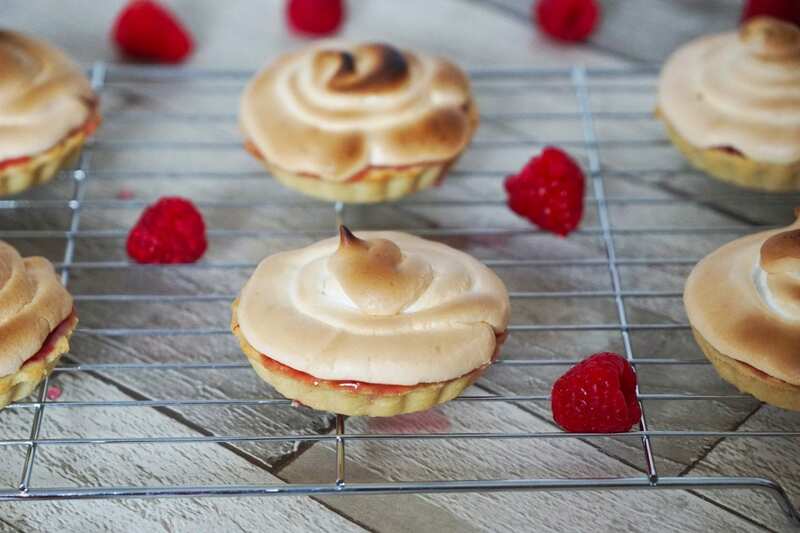 So here is a super easy raspberry meringue tartlet recipe for you to try at home! 1. Make the crust (if you don’t buy pre-made tartlet pastry cases). Pre-heat the oven to 180°C. Whisk together flour, ground almonds, sugar and salt in a bowl. 2. Melt the butter in a saucepan, stirring continuously, then add to the mixture. Stir until fully incorporated. 3. Flatten the dough with a rollin pin. Then, cut the dough in pieces so that it fits into each individual tartlet mold or onto the baking tray. 4. Pierce the dough with a fork. Add greaseproof paper then baking beans on each tartlet and blind bake for 24 minutes. Let cool. 5. Make the raspberry curd. Combine raspberries, sugar, lemon zest, lemon juice, and water in a saucepan over medium-high heat. Then, bring mixture to a boil then reduce heat and simmer for 5 minutes. 6. Remove from the stove then let the mixture cool. Process in a blender. Strain mixture into a bowl and discard solids. 7. Put the mixture back in the (cleaned) saucepan. Whisk together egg yolks and cornflour in a bowl then add to raspberry mixture. Whisk together until it boils. Next, remove from the stove and add butter, stirring until smooth. 8. Place curd into a bowl, cover with plastic, pressing it directly onto the surface of the curd and put in the fridge for an hour. 9. Add the curd onto each tartlet shell until fully filled. 10. Make the meringue. Whisk the egg whites until foamy. Add the sugar and cornflour little by little while whisking. 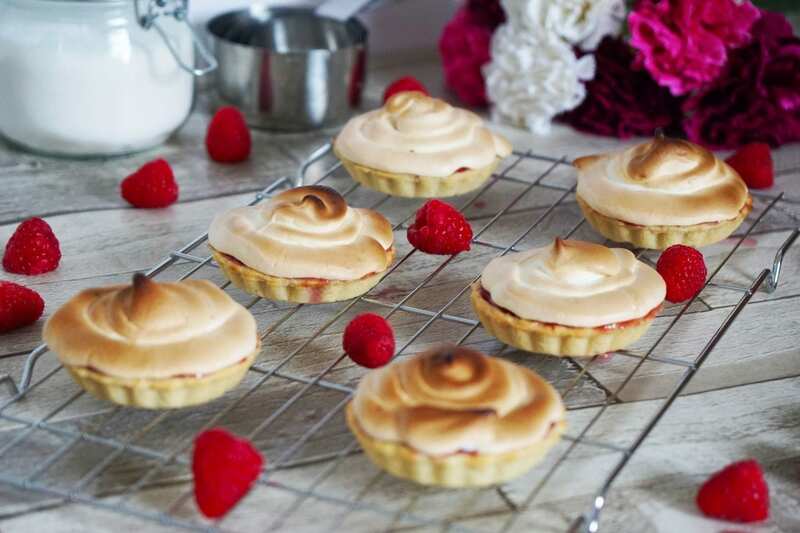 Put meringue on each tartlet, then place in the oven and bake for 5 minutes. 11. Remove from oven. Let cool at room temperature. Serve. What do you think? 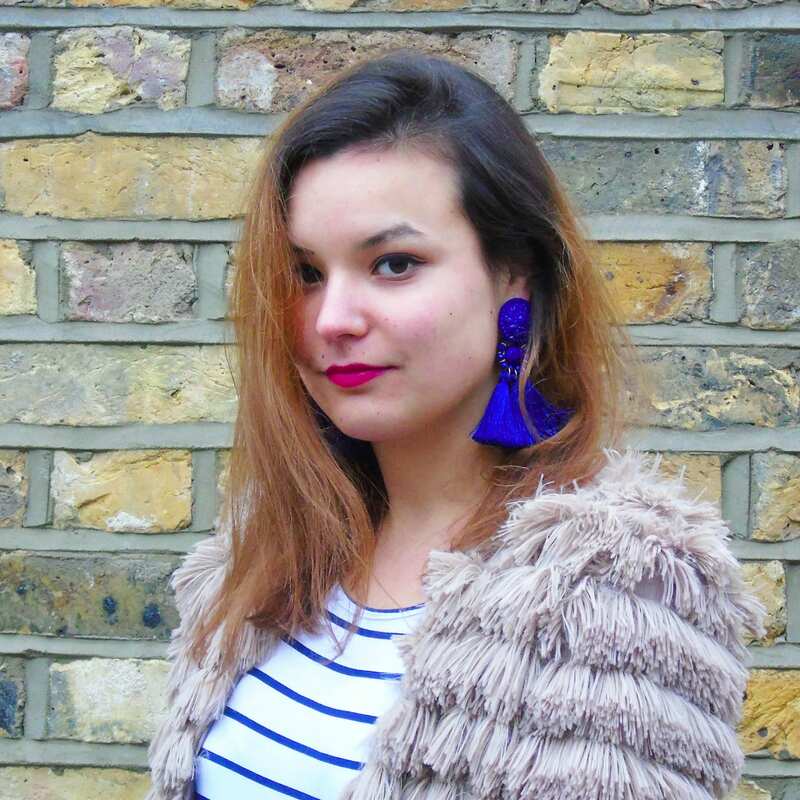 Will you give those a go? There are super easy to make! I mean, I did it! 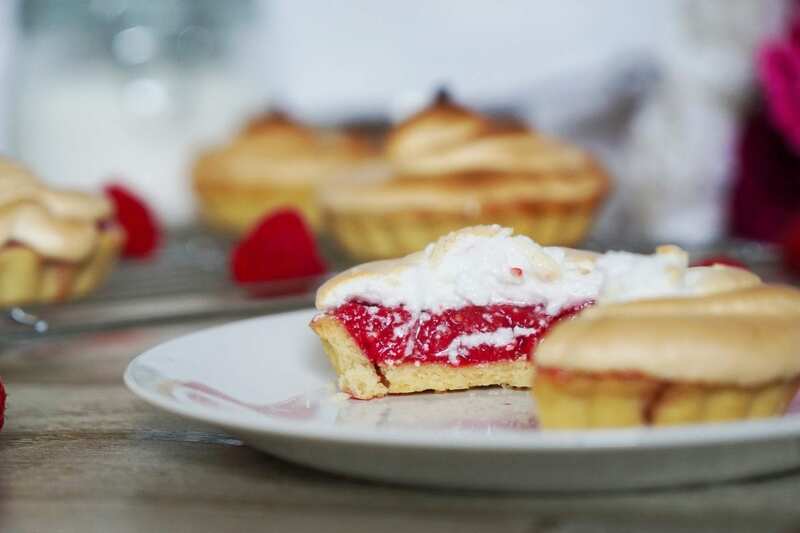 Have you ever had raspberry meringue pie before? How did you find it? I’ve never had meringue pie before and I had no idea they’d be so easy to make! More recipe posts please! They look so yummy! I will definitely be giving these a go, although think I will find them hard to share with others as I will want to eat them all. Recipe looks super easy too, so fingers crossed they turn out just as good as yours! I’ve never tried raspberry meringue pie before! These sound absolutely delicious! They’re so pretty to look at as well! I’m glad it’s not too tricky to make. I’m not the best baker but I would definitely be willing to give this recipe a go! Thanks for sharing! I’ve never tried anything like this before but these look so yummy!! They also don’t look too difficult so even I could make them! Oh wow, these look so delicious! I’m so tempted to make them on the weekend. I’m a sucker for a lemon tart but I’ve never tried a raspberry meringue tart before! The photos you’ve posted are so gorgeous as well! Oh my goodness these look incredible! I love raspberries and lemon so this is like a dream, they sound perfect for Summer too! These sound and look delicious. I am always experimenting with baking, so I will have to add these to my list! These look SO yummy! I’ve never made meringue before as I just thought it was too difficult and something for more skilled bakers! i am in love with these officially. They look so pretty. Wonderful job on the photo’s. Let you know how it went! YUM – those look so good! 🙂 I have a bit of a sweet tooth, so these tartlets are totally up my alley! Saved this post to reference later! These raspberry Tartlets look delicious! I love that they seem pretty easy to make as well. I will have to try them myself. I would just love these. And they are pretty. But the flavors would be incredible! These look amazing! Although I love raspberry, I bet these would be great with a blueberry filling as well! 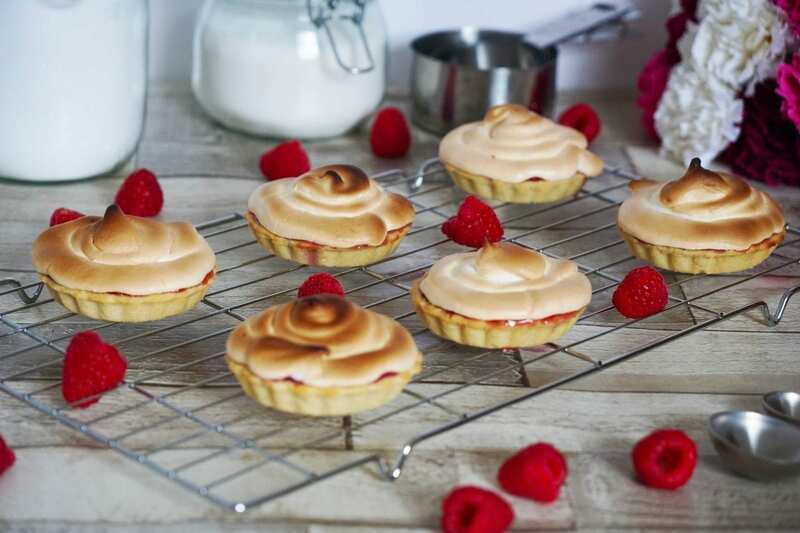 Ok now this recipe sounds amazing I have to admit I love meringue and I bet the raspberry goes so well with it yum! I am not a huge rasberry fan but this just looks delicious! I am going to have to give this a shot! Not much of a baker myself but this is make me wish I was. Will try it if I get the confidence. This is such a cute dessert, I can imagine it being very impressive to guests for a summer brunch. These look amazing! Thank you for the recipe I will need to make these. I believe my kids would love them what a fun summer dessert! These look so delicious!! I love meringue pies, so I know I’d love these. I have always wanted to make it at home, but haven’t tried yet. Maybe I should! Those look so good! I want to make some now. I’m not really a baker infact I barely spend anytime in the kitchen,. However I would sure enjoy one of those raspberry tartlets right now for a late night snack. Your photos are awesome and they make your tartlets are like right in my face!! This is so delicious, def. going to make this for father’s day this weekend. I’m sure everybody will go crazy for this. Meringue itself is not a delicacy I’ve ever been able to appreciate. Although, I must admit—these look divine! 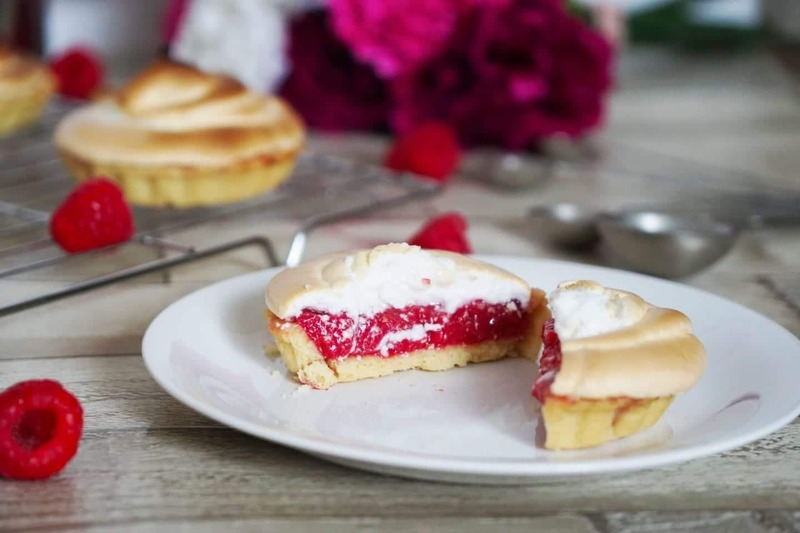 I have never tried a meringue tartlet (considering I’ve never been fond of a straight-up meringue in any flavor I’ve tried), but I can see how the texture of the meringue is nicely balanced by the tartlet crust and the softer texture of the filling. Definitely something I would try! These look so good! I love all the pictures as well. I will have to try this, thanks for sharing. These look like they would be absolutely amazing. I think my family would eat these up super quick! Stunning! These sure don’t look homemade 🙂 I had a similar pie in a coffee shop in Berlin once and it was yum!! I love exploring and trying on new recipes. This one is new to me and I should give it a try. It looks super easy to make. I love the tangy taste of raspberry and that sweet toasted meringue on top. heavenly! Aha well as you know I am much better at eating than I am cooking but you totally need to make me some cakes because these tarlets look absolutely delicious! And the fact that it has raspberry is even better, while your product shots are beautiful as always. You should definitely dedicate an Instagram to your product photography- or cake! I absolutely adore all things raspberry so this recipe definitely has my attention. It looks delicious! This looks delicious. Raspberry is so good ! i should attempt this one day. its be great as an afternoon dessert with tea or coffee.